World Environment Day, held each year on 5th June, gives us yet another opportunity to sit up and re-evaluate our living style. This year’s theme is “Beat Plastic Pollution”. It is estimated that about 13 million tons of plastics leak into the ocean each year, and about 100 000 marine animals killed by plastic each year. These estimates from trusted environmental organisations reveal how plastic pollution has grown to be the world’s biggest environmental challenge. The amount of solutions or the implementation of plastic solutions is not catching up to the amount of plastics being dumped onto the environment. Sustainable behaviour needs to be practiced by everyone from this day onwards to reduce and solve the plastic problem. India being on the top list of the biggest consumers and polluters in the globe, have taken the initiative to change their ways and lead in practicing sustainable behaviour by hosting this year’s World Environment Day, focussed on the world’s mounting plastic problem. India is taking leadership, given it has one of the highest recycling rates in the world. It can be instrumental in battling plastic pollution across the world. The World Environment Day is a United Nations Environment led global event, one of the most celebrated environmental days each year, recognised and celebrated by many communities. India caught the World’s eye when their Versova Beach in Mumbai had about 5.5 feet high plastic garbage on the whole coast, no one could walk along the coast let alone to swim in that ocean. Two years down the line they managed to turn it all around from disgusting (by their own admission) to currently one of the most beautiful coastal stretches of the world. The whole clean-up was done by community volunteers led by a high spirited Lawyer and Environmentalist Afroz Shah, who after moving into an apartment located by the coastline could not believe what he came across on his backyard ocean view side. He rallied up people to amazingly turn around the trash-ridden coast to pristine. The Versova’s case study now challenges and inspires the whole world to rise up and start leaving responsibly. It is totally not impossible to turn around even the most heavily polluted places to pristine as it has been done and achieved by our fellow people in India. 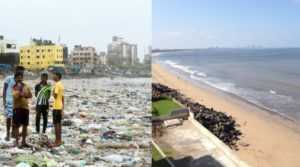 The Transformed coast of Mumbai, from trash ridden to prestine. Presently there is a big island of floating plastic garbage in the Pacific Ocean known to date as the Great Pacific Garbage Patch. This floating mass of plastic is said to be as big as Alaska and it is just moving along with the pacific current. Tenikwa Wildlife Rehabilitation and Awareness Centre is already practicising responsible business processes. We took one step closer to reducing single use plastics, having recently stopped providing Plastic Straws at our Chesters Café. This is such an easy initiative to institute and one of the eco-friendly steps to beating plastic pollution as it is estimated that over 500 million straws are used daily in certain world class fast economies like the United States and most of which find their way into the ocean somehow. It all begins with us, to have a pristine environment that will sustain its own natural systems and create a better future we all wish to have. We need to simply Reduce, Recycle and Reuse.